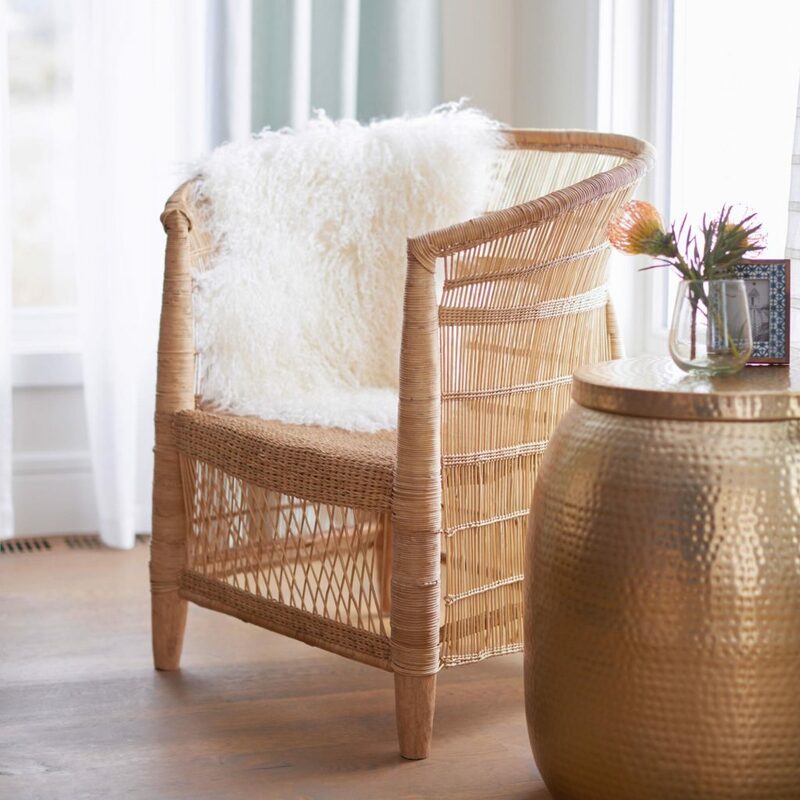 With all of the gorgeous summer nights we get to experience here in San Diego, I’ve been thinking about redesigning my front porch to be able to enjoy each sunset from the comfort of my own home. 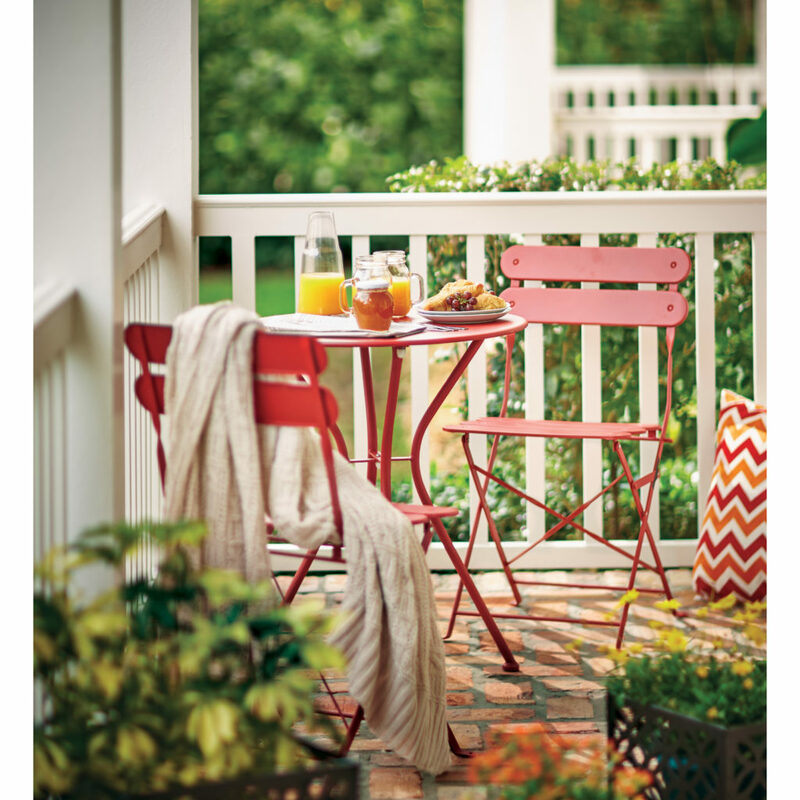 There are so many ways to design a beautiful and functional porch regardless of how large or small your area may be. 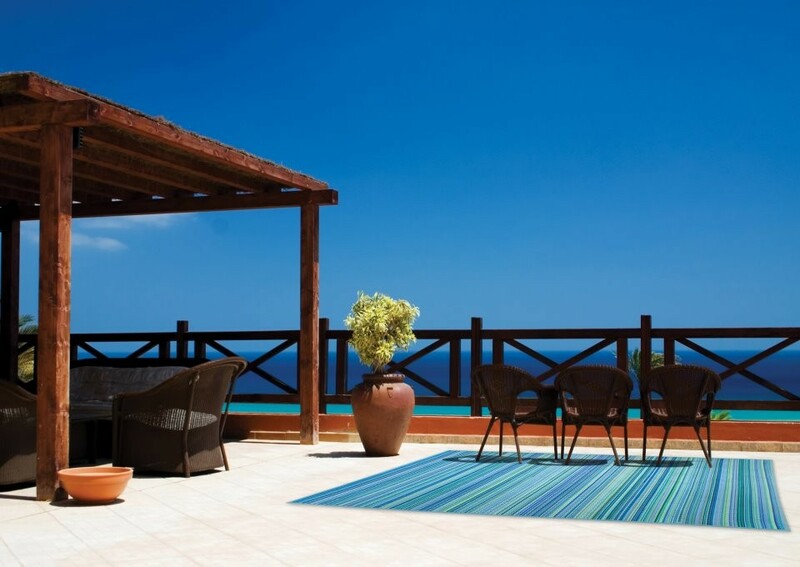 Do you prefer to lounge out front in a rustic Adirondack chair? 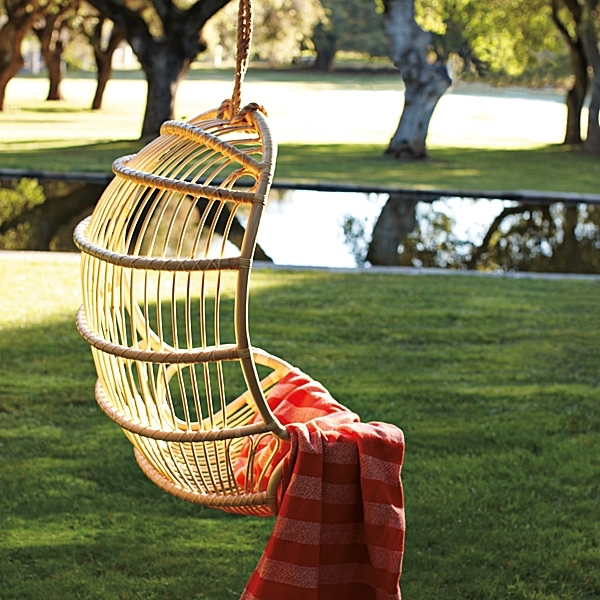 Or perhaps cozy up to a nest or hammock? 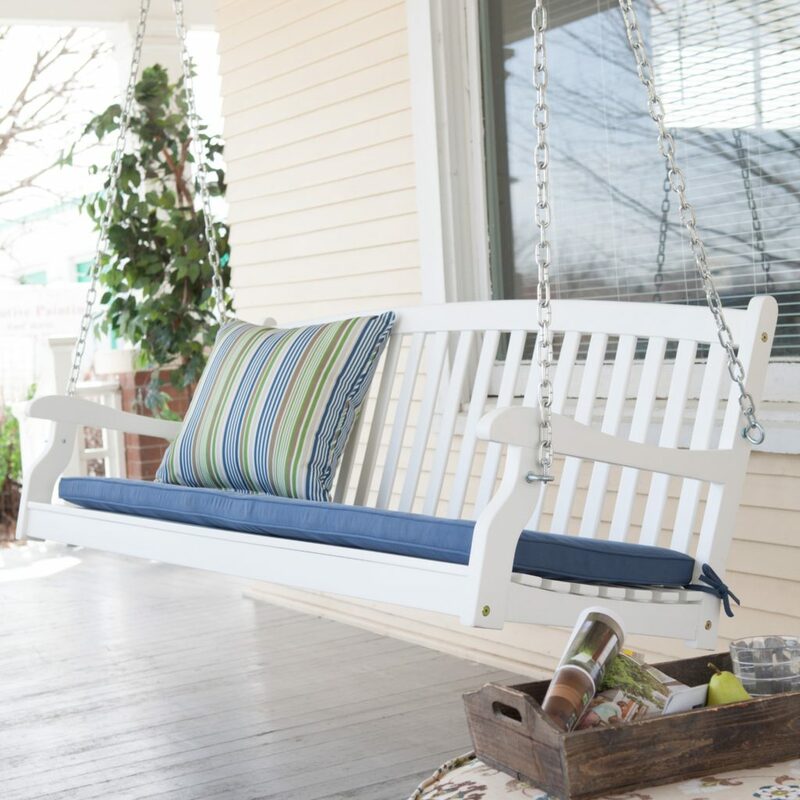 There are so many options to choose from that can work in even the smallest of porches! 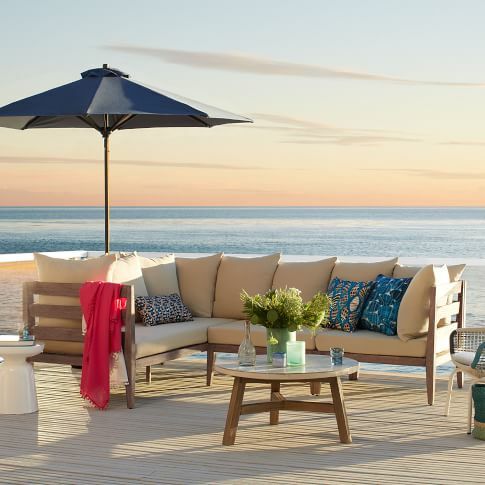 My husband and I live right by the beach, and love to spend our evenings outside grilling and enjoying the evenings from our porch. 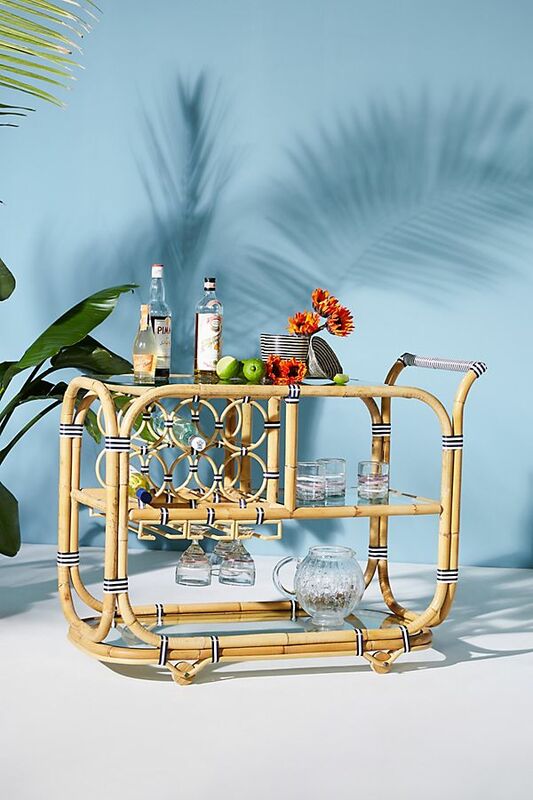 Having a smaller area to work with, we’ve been looking for the perfect little bistro set to have a drink and some munchies on without using up too much space! 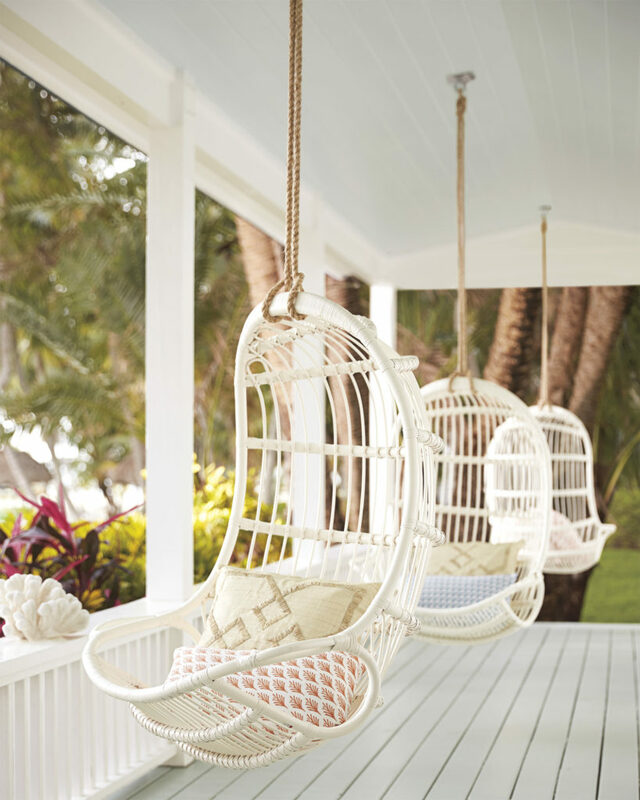 These hanging nests are so fun and look just absolutely cozy! 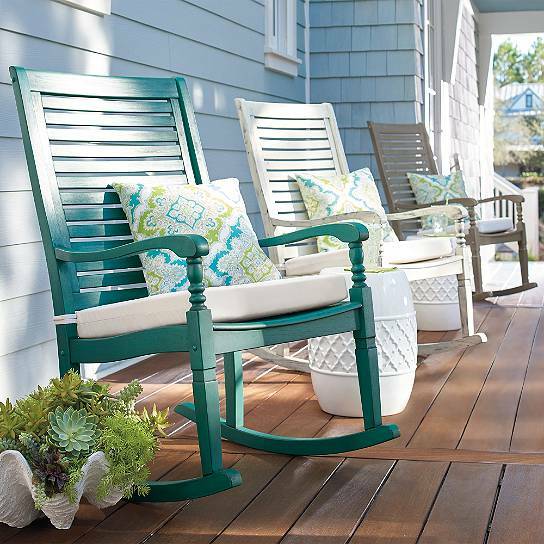 If you’re looking for something more traditional, you can never go wrong with paired rockers. 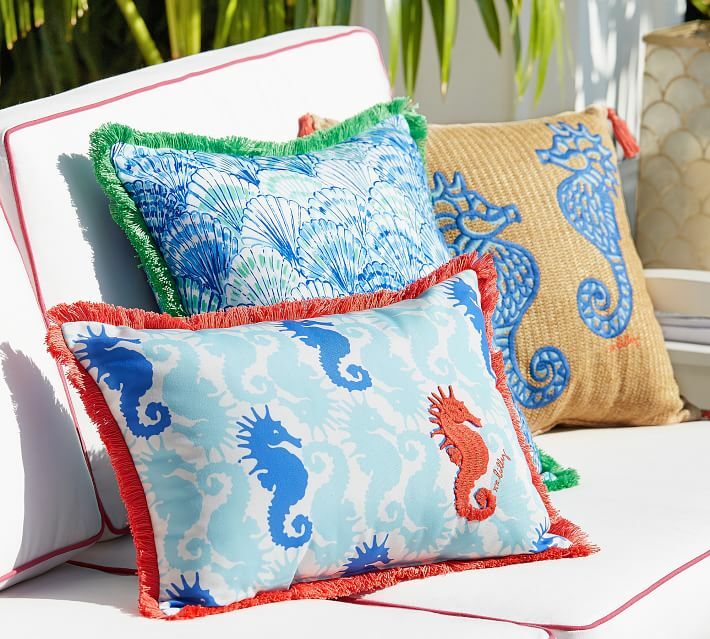 Brighten it up and add some personal style for each season with fun pillows like these! 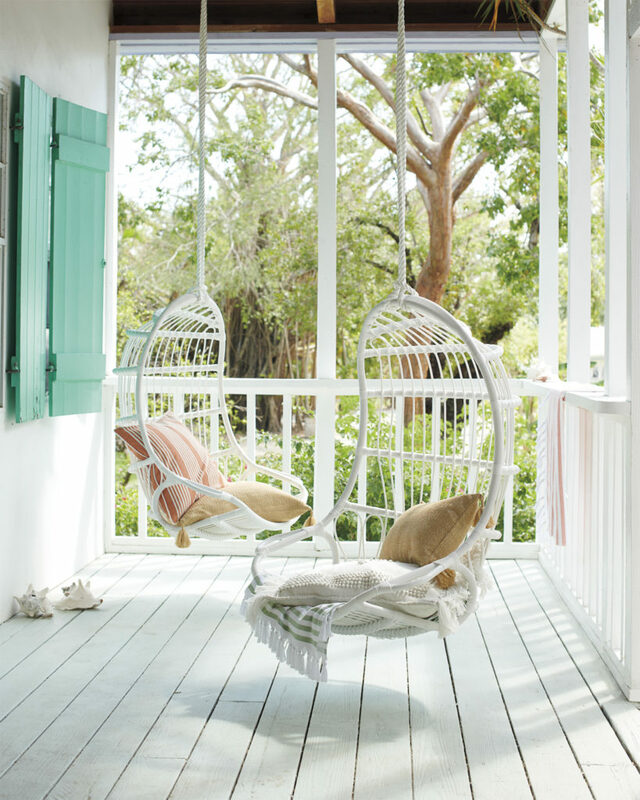 When I see nests as comfortable-looking as this, I just want to curl up with a good book for hours, don’t you? 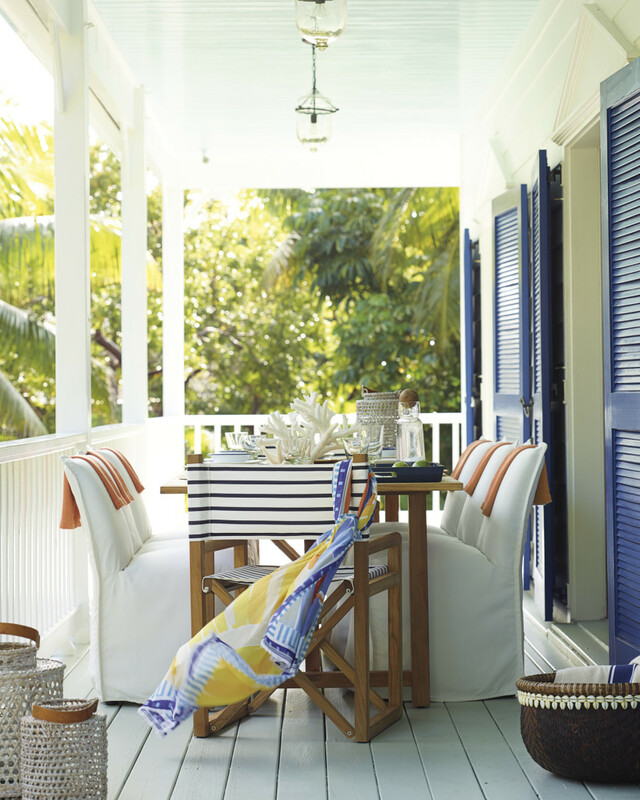 Personally, I’m a huge fan of whites and neutrals in the home, and I especially love the fresh, bright look it gives this porch. 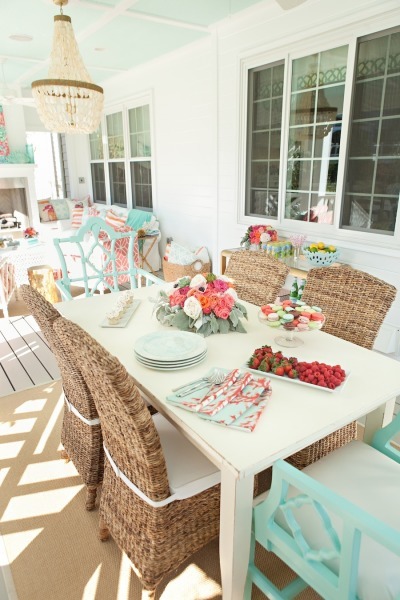 I love the way they incorporated a little pop of color with that gorgeous turquoise bench! 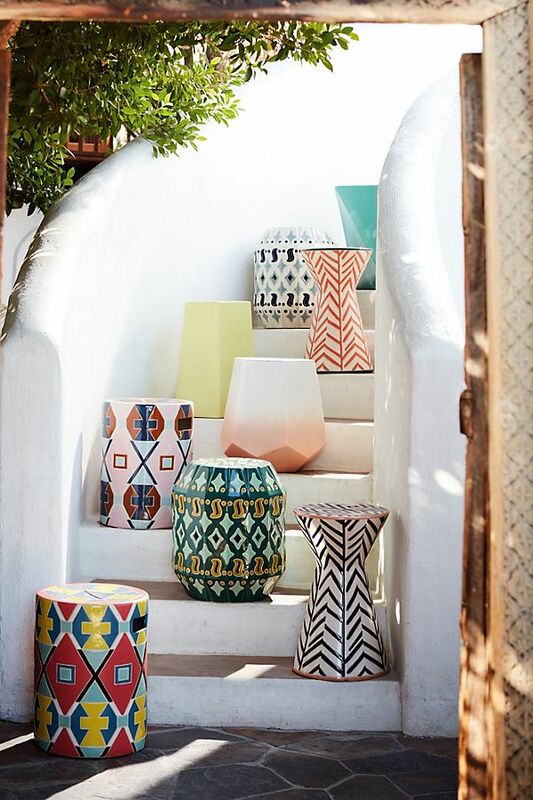 Always a favorite, Kouboo knows how to add some serious style to a porch! 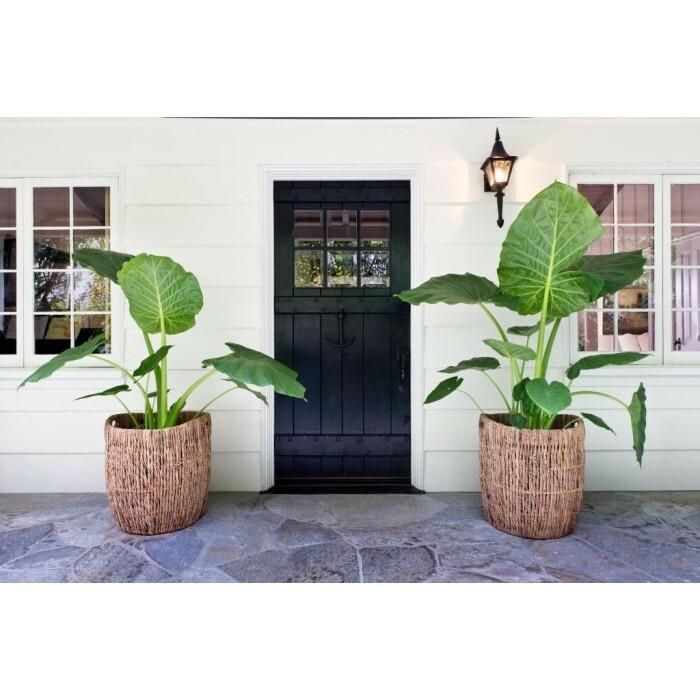 If you prefer to lounge in the backyard, try making a bold statement with tropical plants out front! 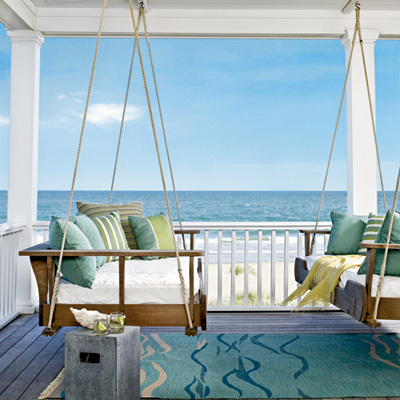 I love this idea for a family beach house. 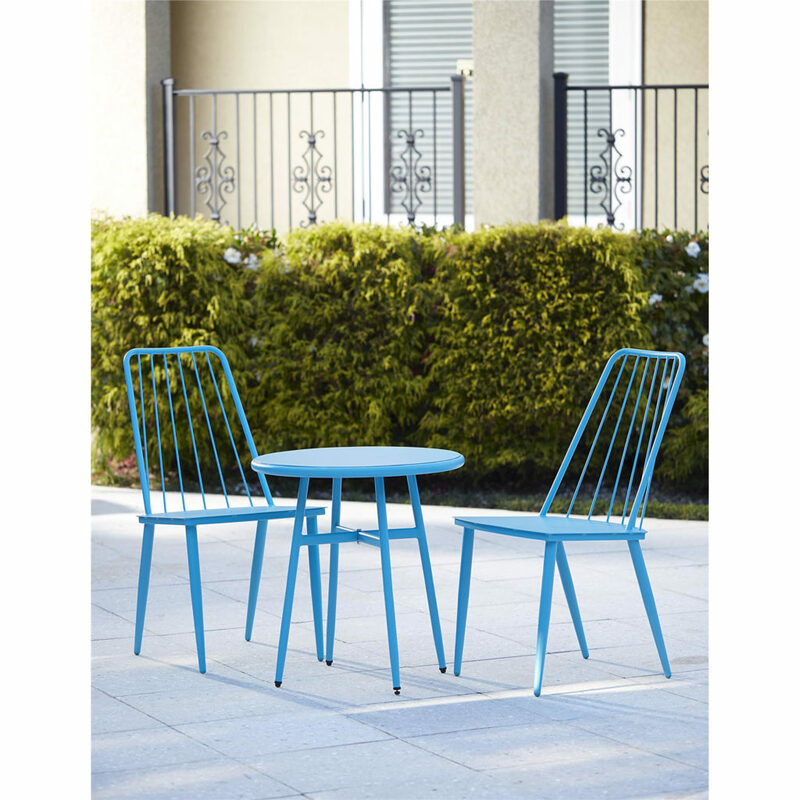 Although they are the same style rocker, the differing colors add a fun edge- not to mention that each person can pick their own color. 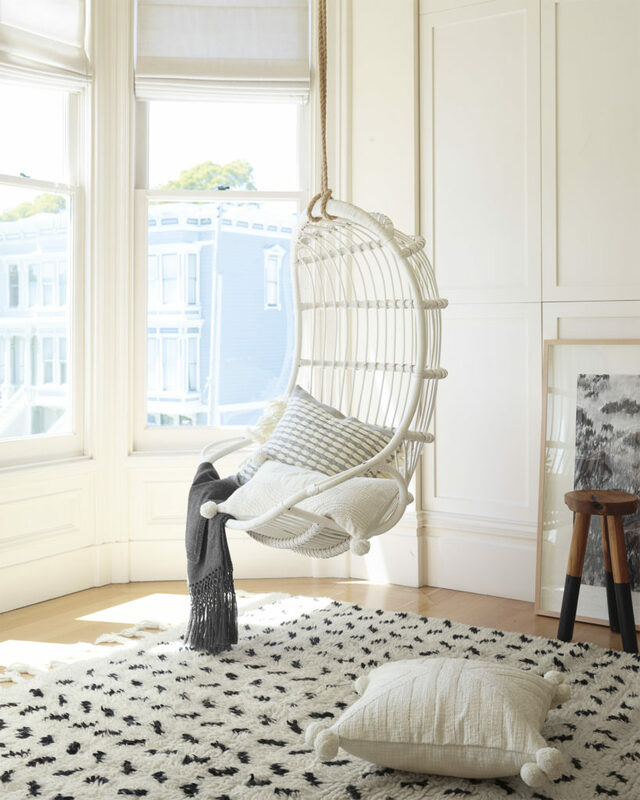 If you like the hanging nest, add a little uniqueness with a design like this seahorse or a hanging bench with funky throw pillows! 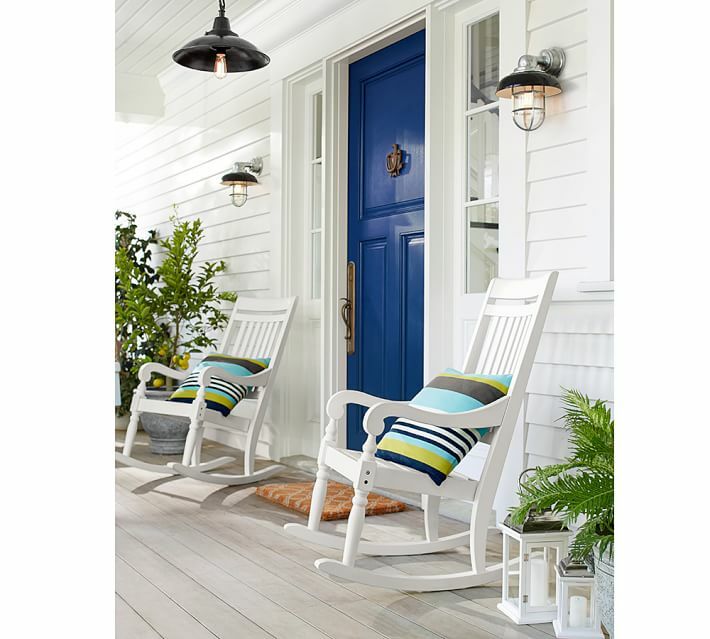 Which style front porch do you like best? We always love to see your pictures! 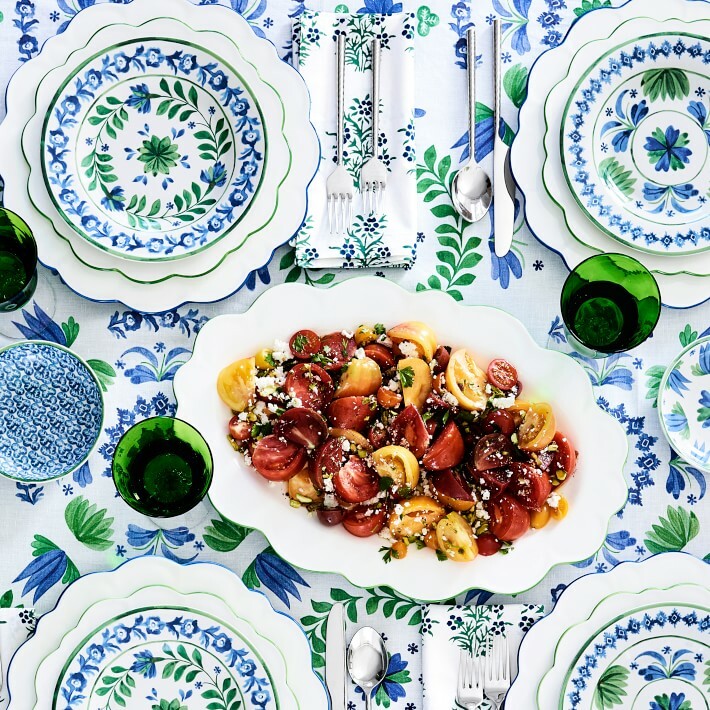 There’s nothing lighter and airier than a breezy white curtain blowing in a summer wind. But why only bring out the whites between Memorial Day and Labor Day? 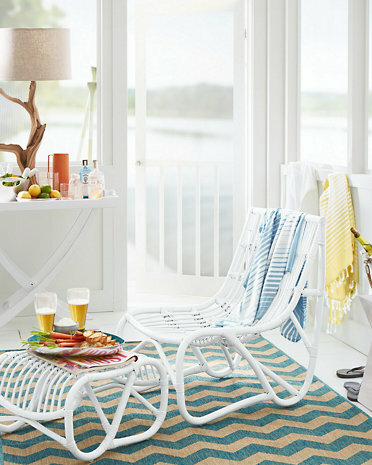 For a fresh look 12 months a year, add a soft summer white and keep a little summer in your home year round. 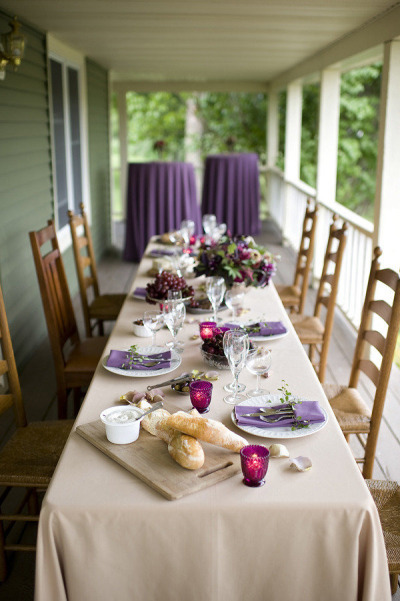 I love the whitewashed woods mixed with the creamy neutrals. The Kouboo Chandelier just completes the room. Stash some white accessories around…they go with everything! Nothing beats white curtains on a white wall for a fresh “summer” feel. 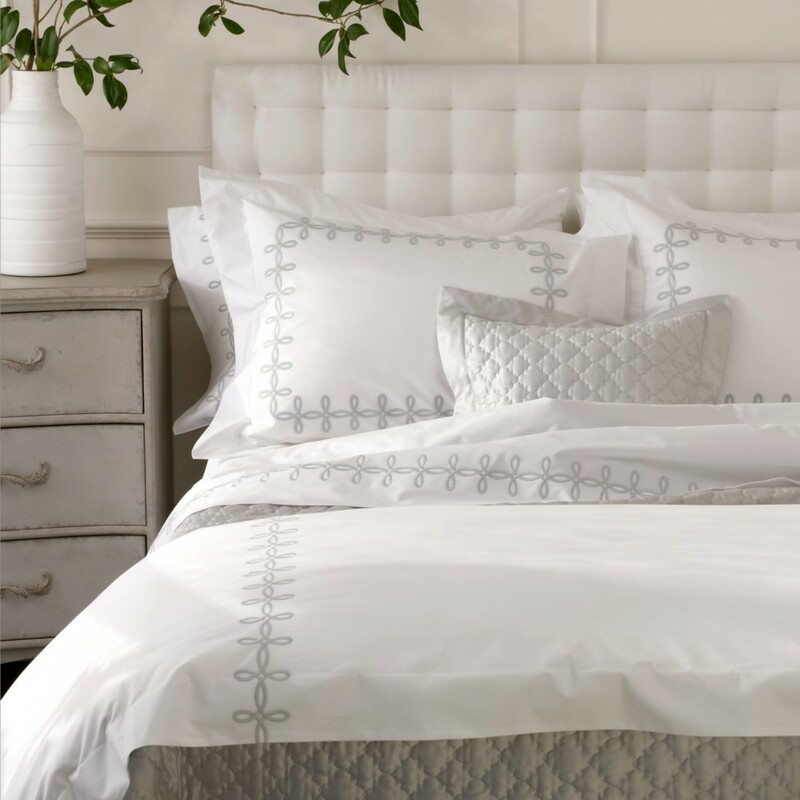 And crisp white bedding is a practical and pretty solution for what to put on the bed. 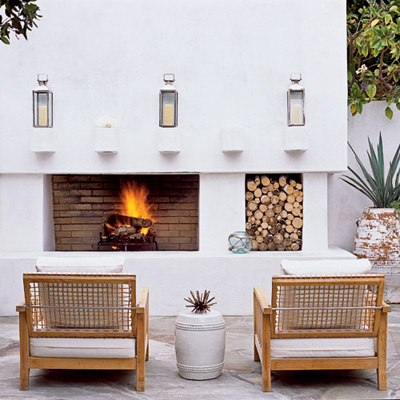 A white sofa and table don’t have to be monochromatic. 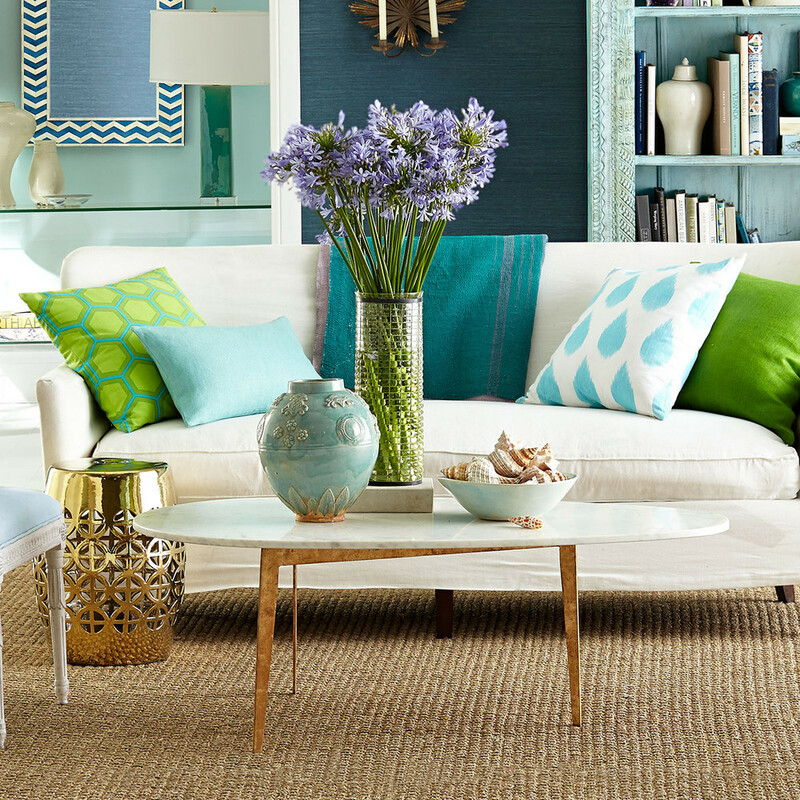 Change it up with colorful pillows and accessories, and you have a room that can change along with your mood. 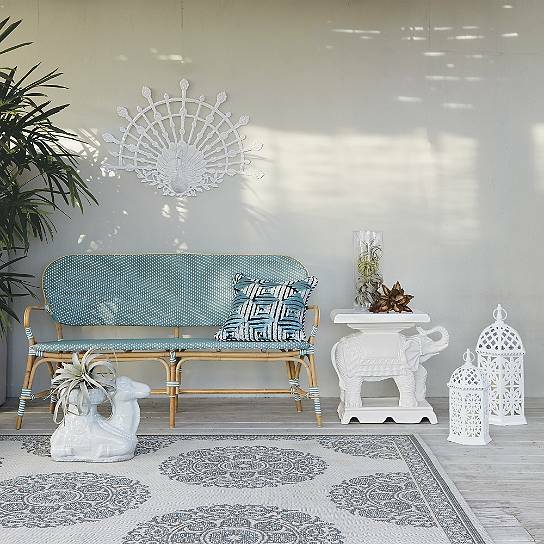 White outside on cushions? Absolutely! Make sure they’re washable and you’ll have them for many seasons. 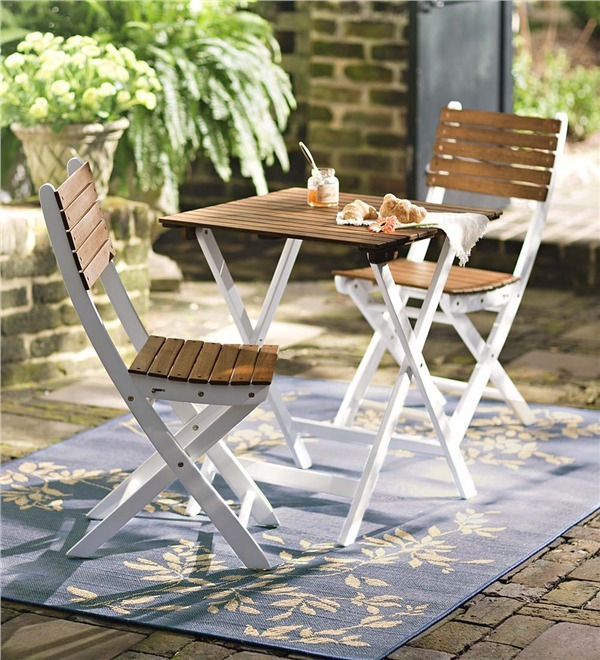 White slipcovers also are a great, practical solution – just make sure they can be easily cleaned and you’re ready to go. 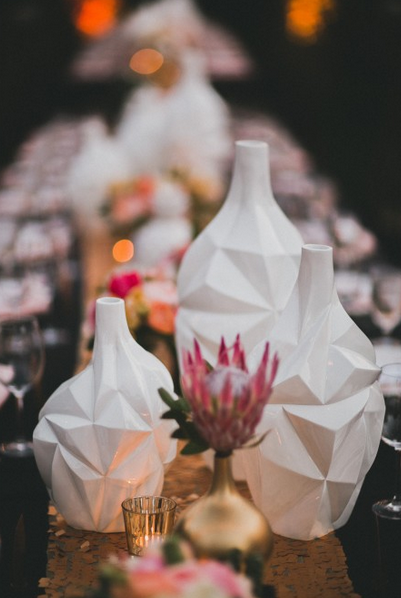 What’s your take on white all year long? 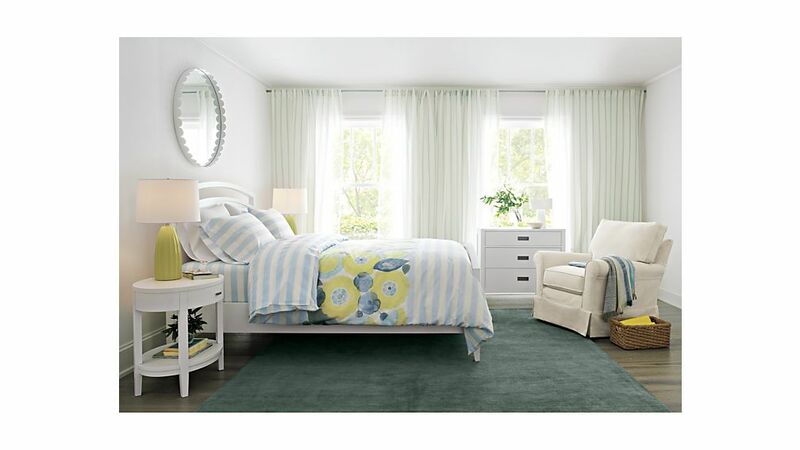 Do you have a favorite room to use this crisp, clean look in? 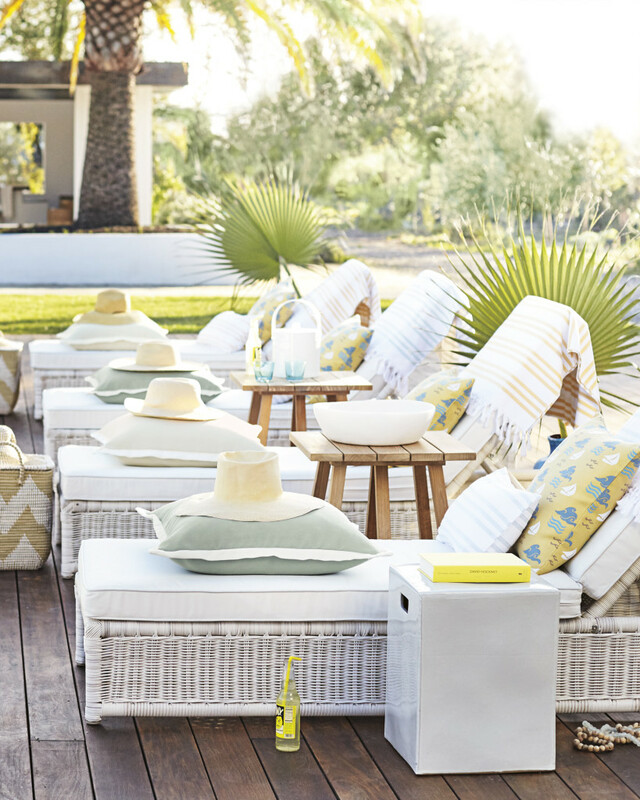 In our last blog post, we showed you how to update your outdoor décor for this summer. Now it’s time to bring your dog outside with you! Let your dog cool off in the pool or lounge in the shade while you enjoy a beautiful summer day! MANY dog owners cringe when you mention bath time for their pups. We know firsthand how tough (and messy) it can be trying to fit a German Shepherd in a bathtub for bath time, so take advantage of these warmer days, and take your pup OUTSIDE for his bath this summer. If your dog is easily spooked by a hose, try the dog bath from Charles & Hudson. For larger dogs (who may need more of a heavy-duty cleaning!) 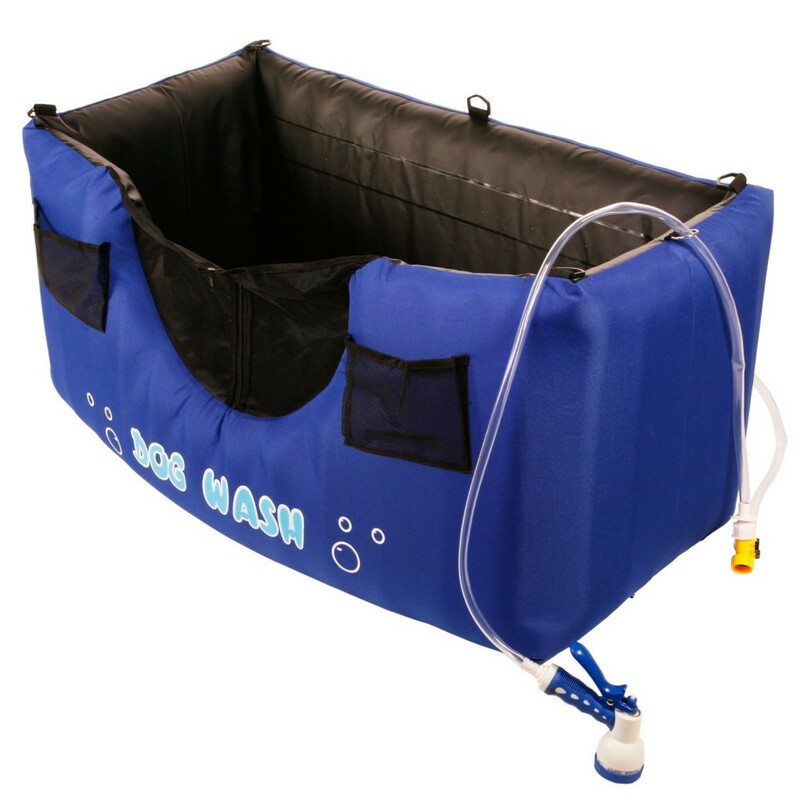 the inflatable dog wash is a perfect choice. Not only is it perfect for storage, but it will help prevent your yard from turning into one big mud pit after a bath! If you have a pool, chances are it’s probably hard to keep your dog out of the water during summer. Why should you? 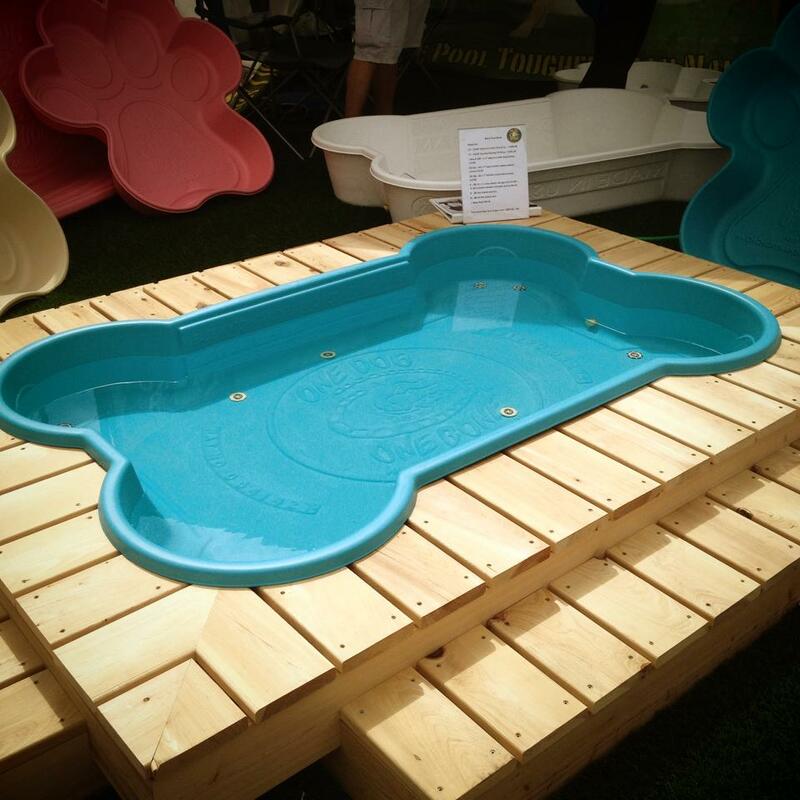 Give your pooch a float to lounge on while staying nice and cool at the same time! 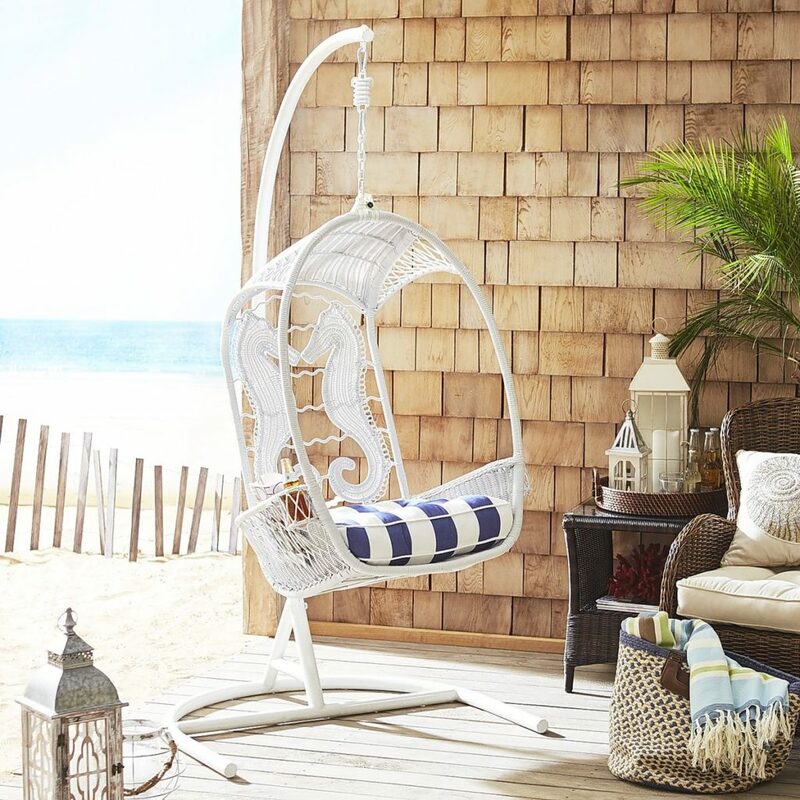 Instead of watching your little ones curl up under the tree for shade, let them hang out next to you in this chaise lounge to stay out of the sun. 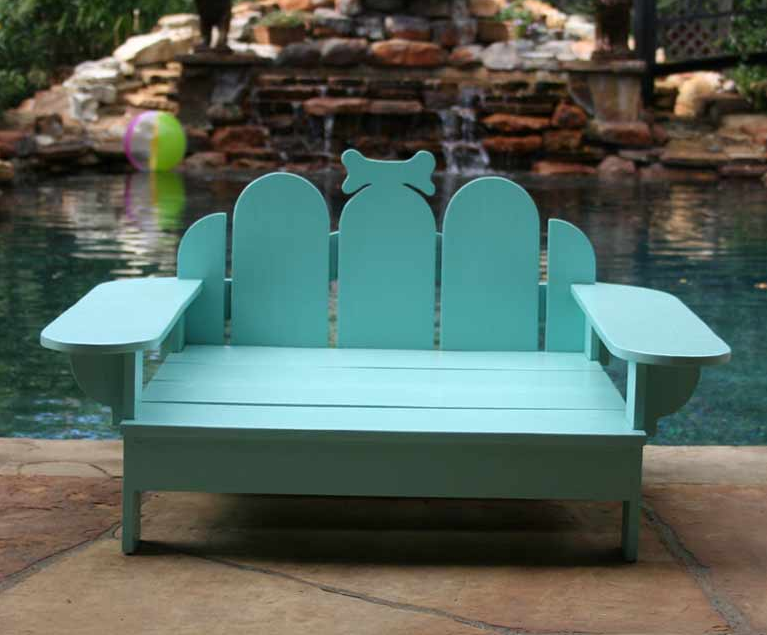 The design will look great on your patio, and your dogs will thank you for a cozy place to cool off! Ok, does this Adirondack chair come in human size?! Add a machine washable cushion for your pup to rest her head on, and this chair is fit for a queen! 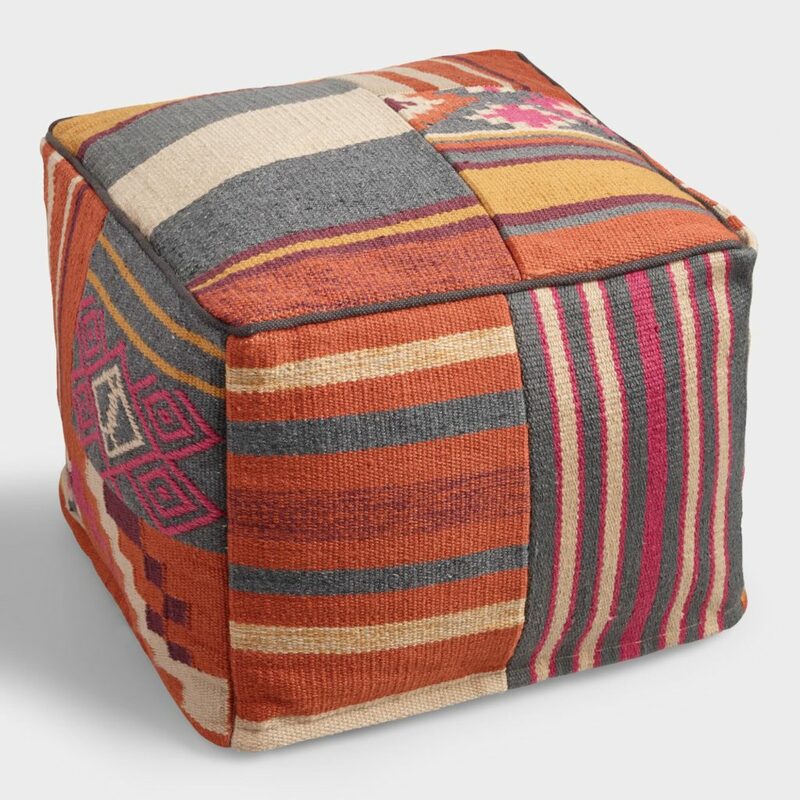 This would be perfect for shadier patios or cooler days! The one thing EVERY pet-friendly patio needs is a constant supply of fresh water to keep your dog hydrated. 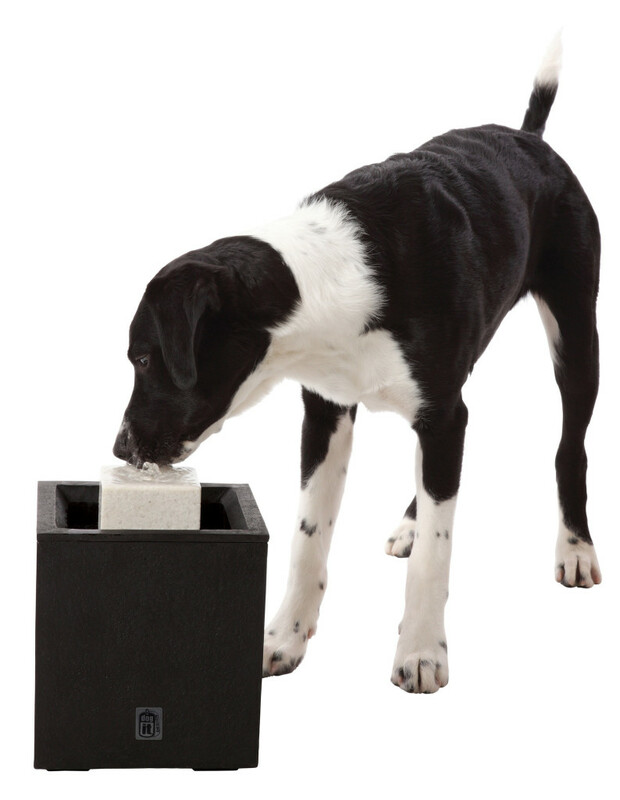 This outdoor pet drinking fountain by Hagen is a stylish (and practical) alternative to the ever-filthy patio dog bowl. 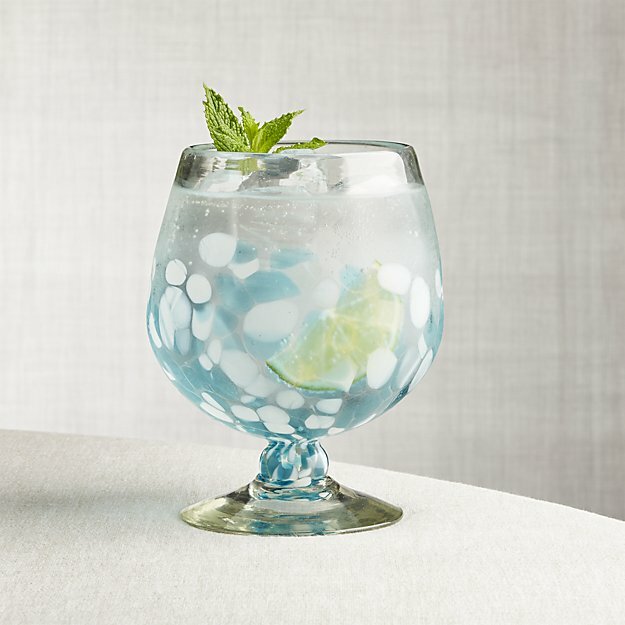 The fountain will keep your water always fresh and always flowing, perfect for hot days and muddy backyards! From our family to yours, we hope to make YOUR summer the best that it can be, furry family members included! 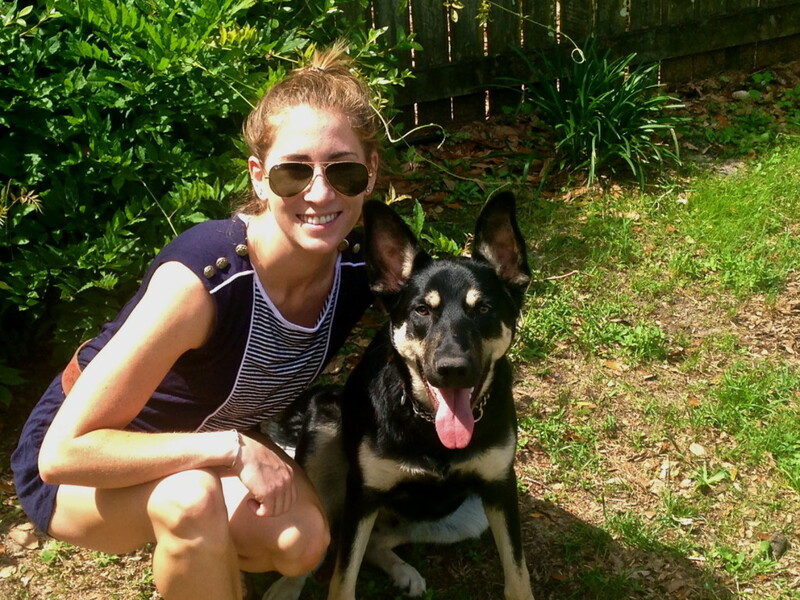 Have any pet-friendly tips of your own? Share them with us! 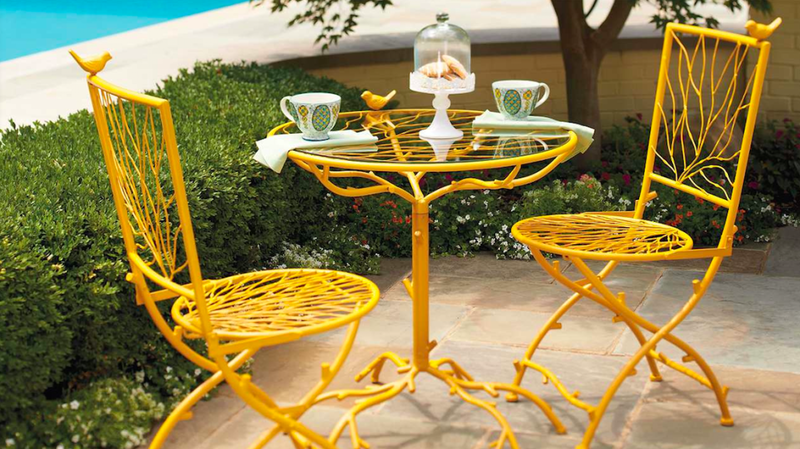 Spring has sprung, and with warmer weather heading our way, it’s time to bring your furniture outside! 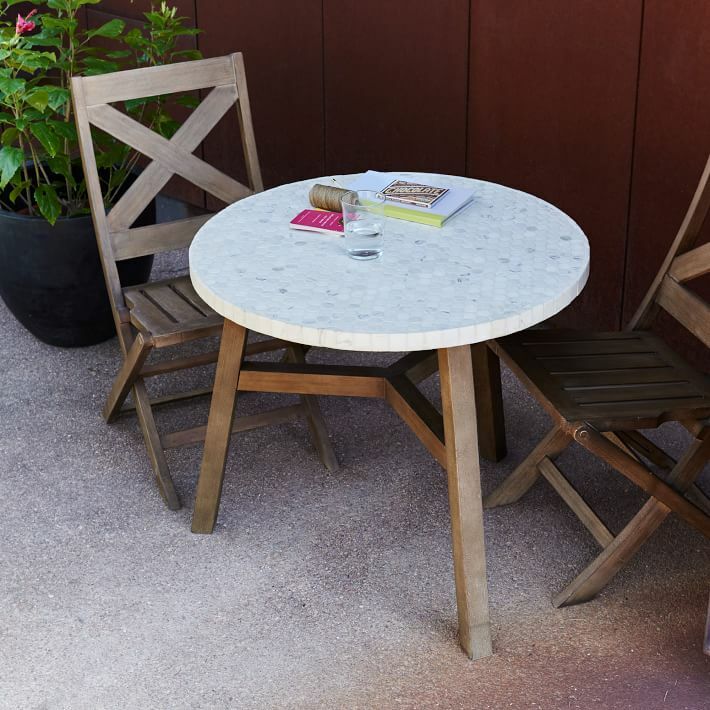 Whether you’ve got a large patio or working with a smaller space, we’ve found something just for you! 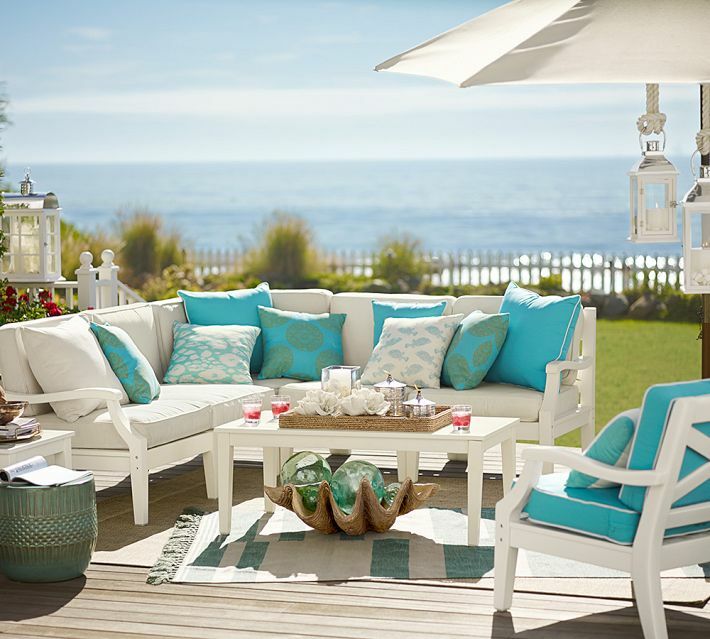 Although I LOVE the pop of turquoise they’ve chosen for the pillows and cushion, the best part about this sectional is definitely that it’s a “build your own”. 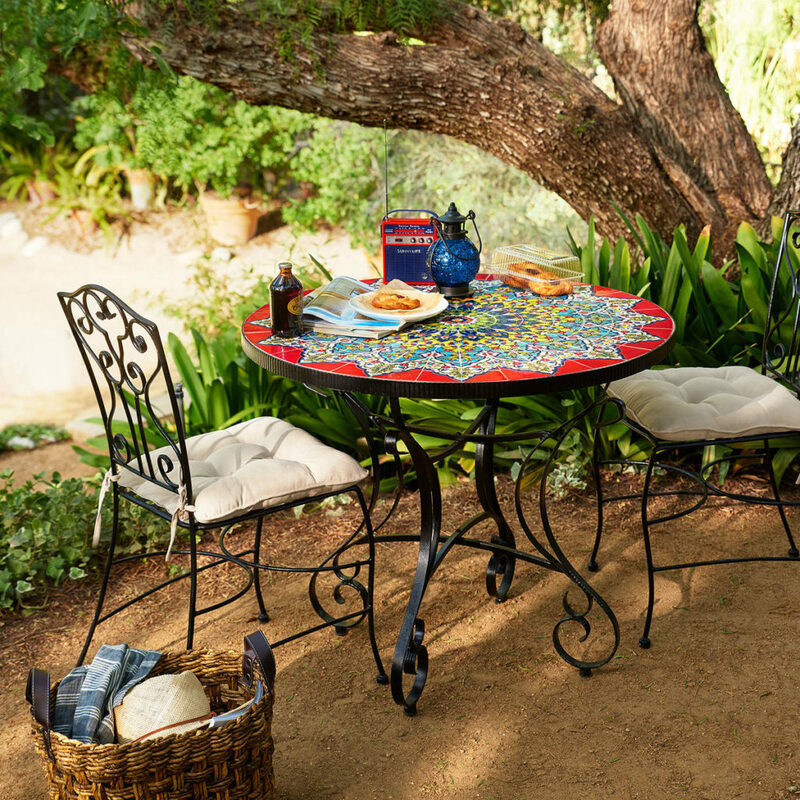 This feature allows you to customize it to fit your space, so it will be perfect on any patio! 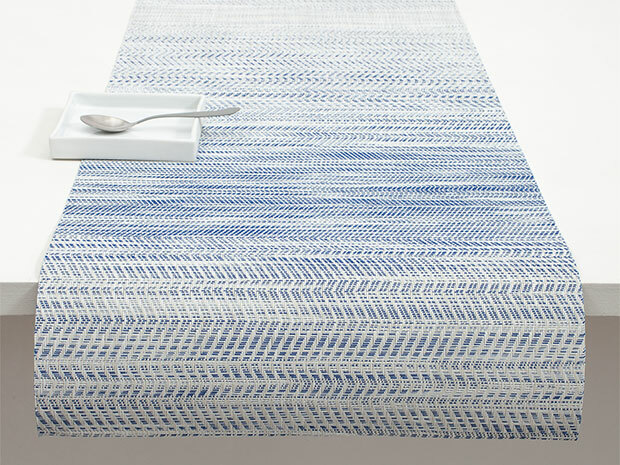 If you already have your furniture set, you may be in need of some fresh fabric this season. 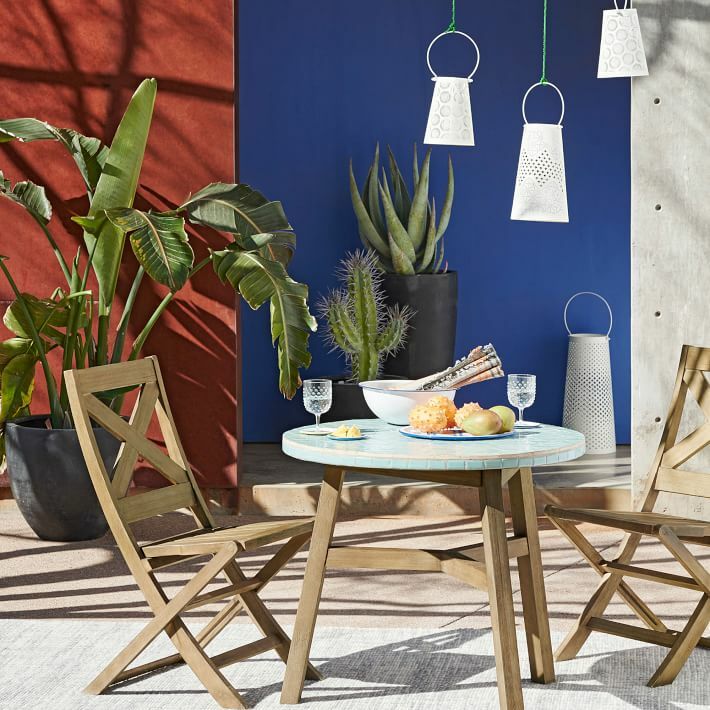 Our choice is the Groundworks Ventana Solarium line by Lee Jofa- it is perfect for both indoor and outdoor, with beautiful tones that will pair nicely with any furniture you already have! 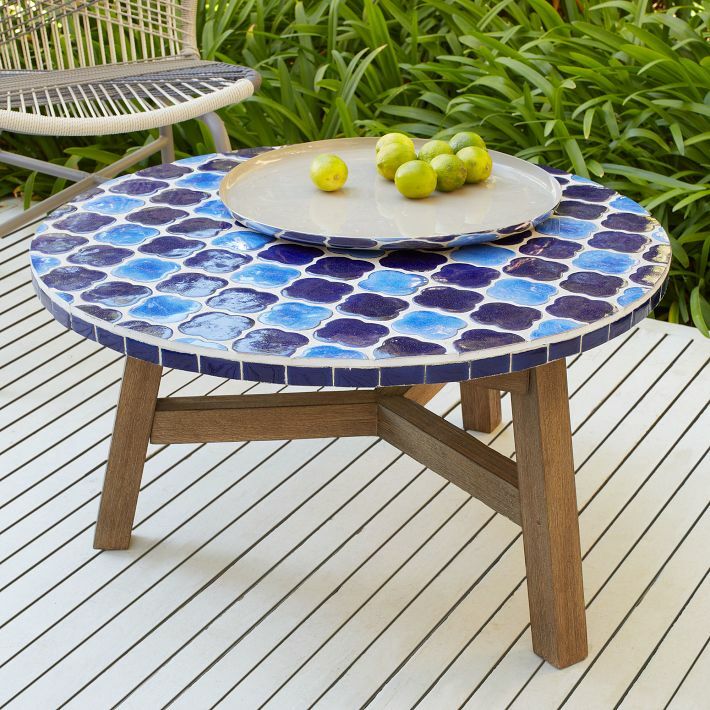 My first choice for an outdoor table is almost always mosaic tile. 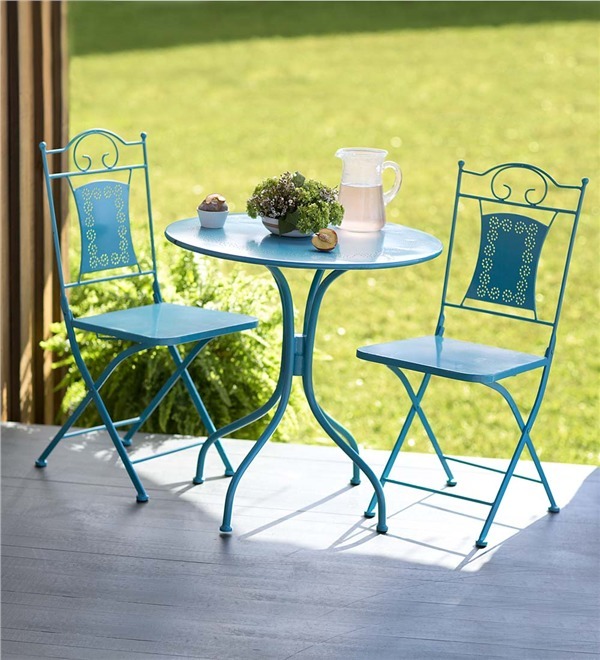 These hold up beautifully in any condition, and are true works of art for your patio! 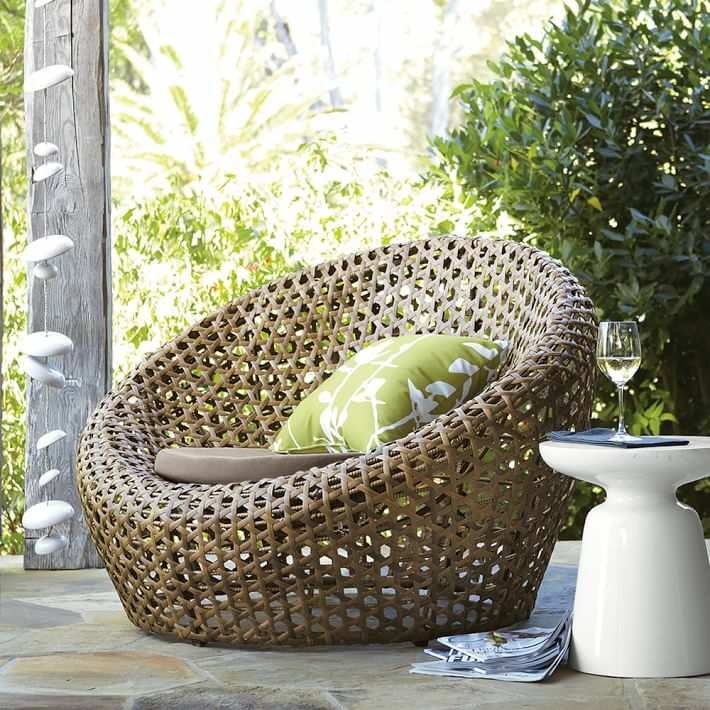 Rattan is another great choice for outdoor furniture as it really brings that beachy element in to your home. 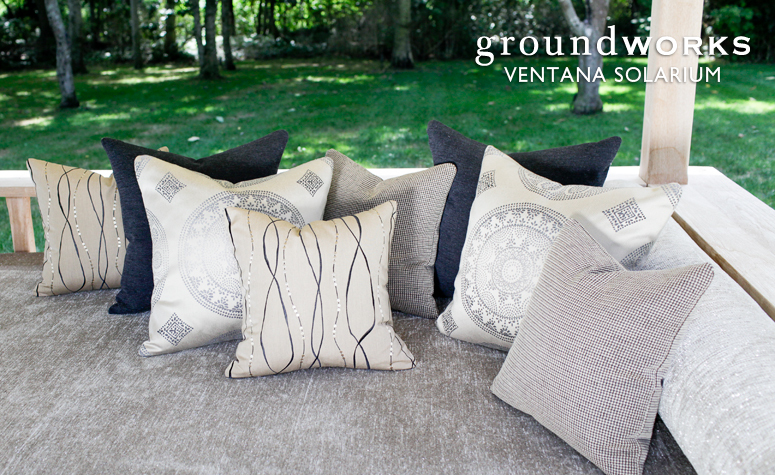 You can use it indoors or out, or even add cushions to make it more cozy! 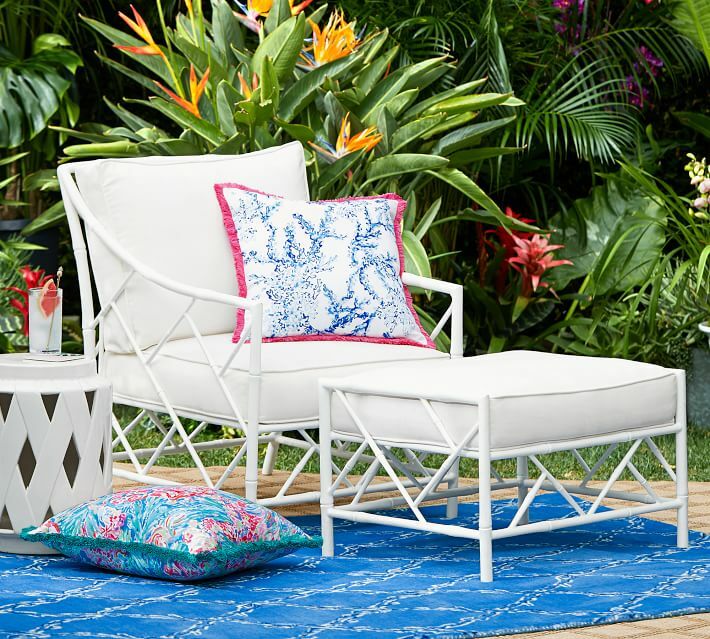 Pair this white rattan chair with a beautiful handpainted garden stool or use it as a small end table! 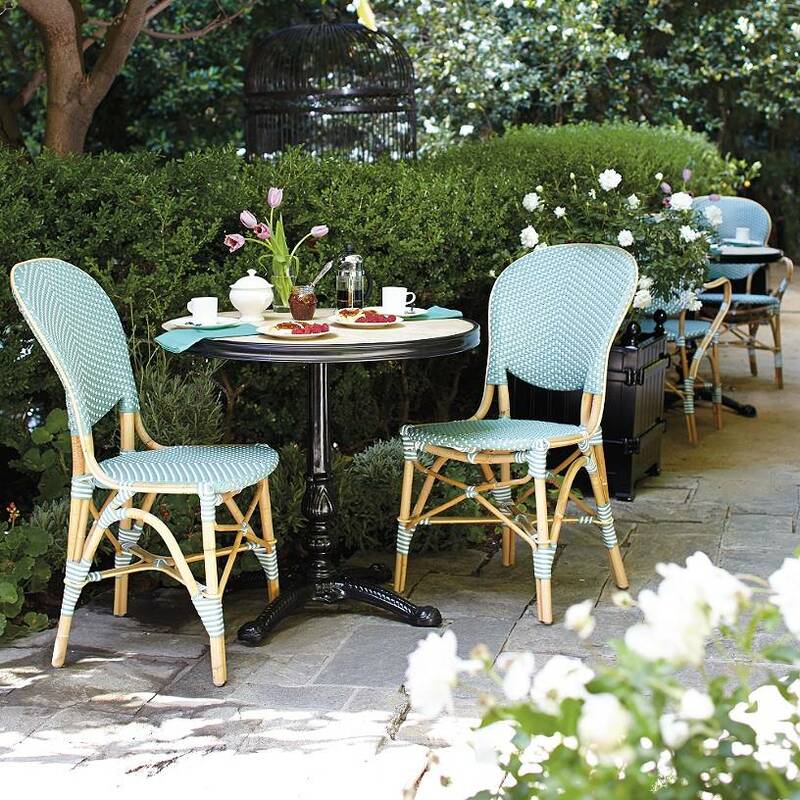 If your patio is suited better for two, a little bistro set is the best choice for you. 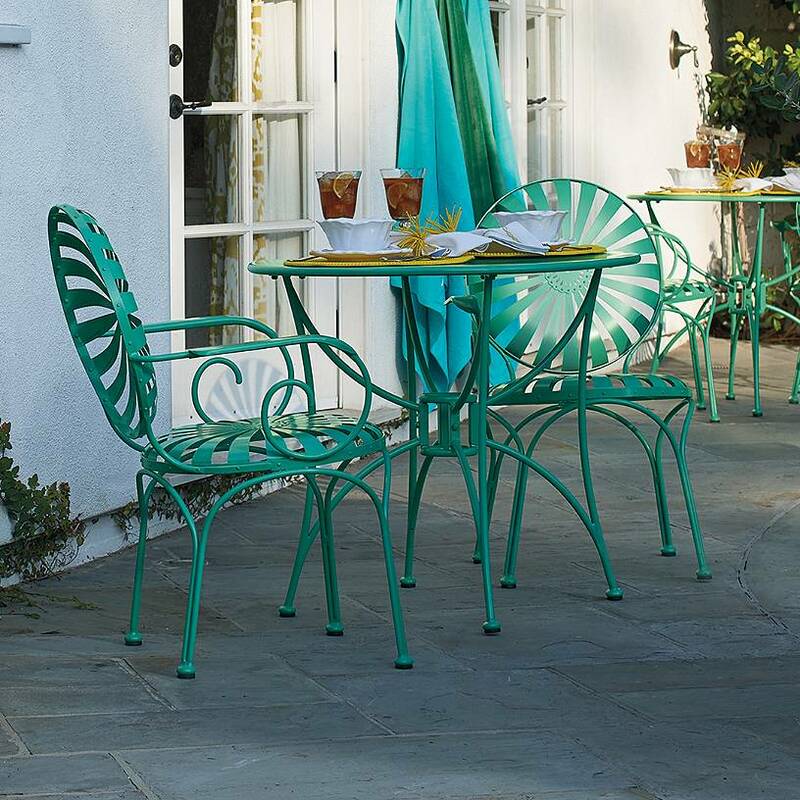 You don’t have to sacrifice gorgeous patio furniture for a smaller space, especially not with a fun, vibrantly colored piece like this one! 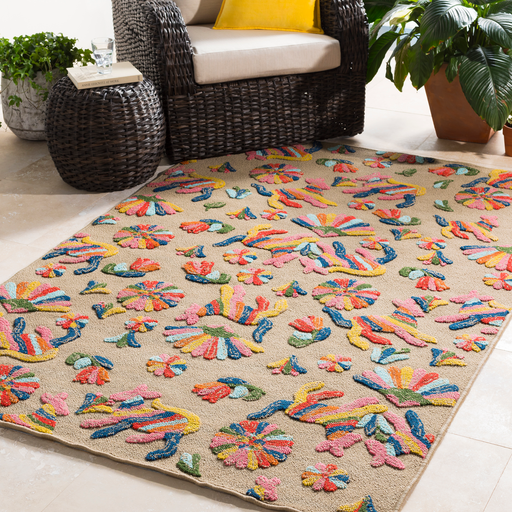 If you are looking for an easy way to bring the tropics to your house, look no further than this cerulean indoor/outdoor rug! 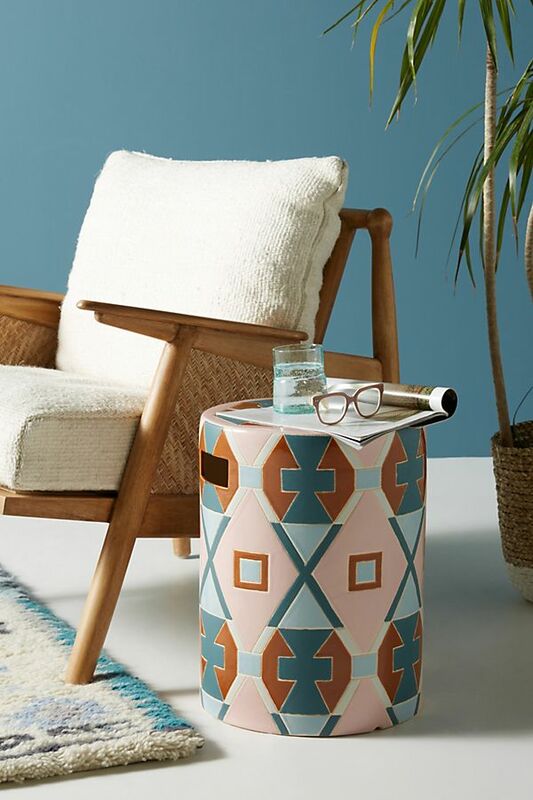 Use it like they have done here with some lounge chairs, or put it next to your “build your own” sectional to amp up your color palette! 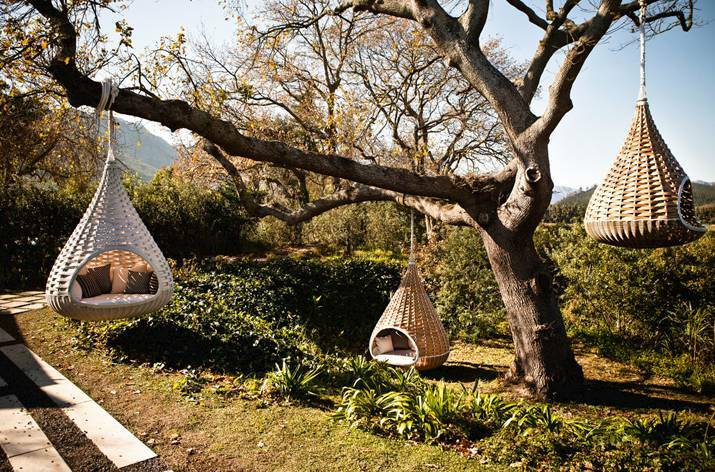 What outdoor furniture could you possibly find that is cooler than these hanging nests? 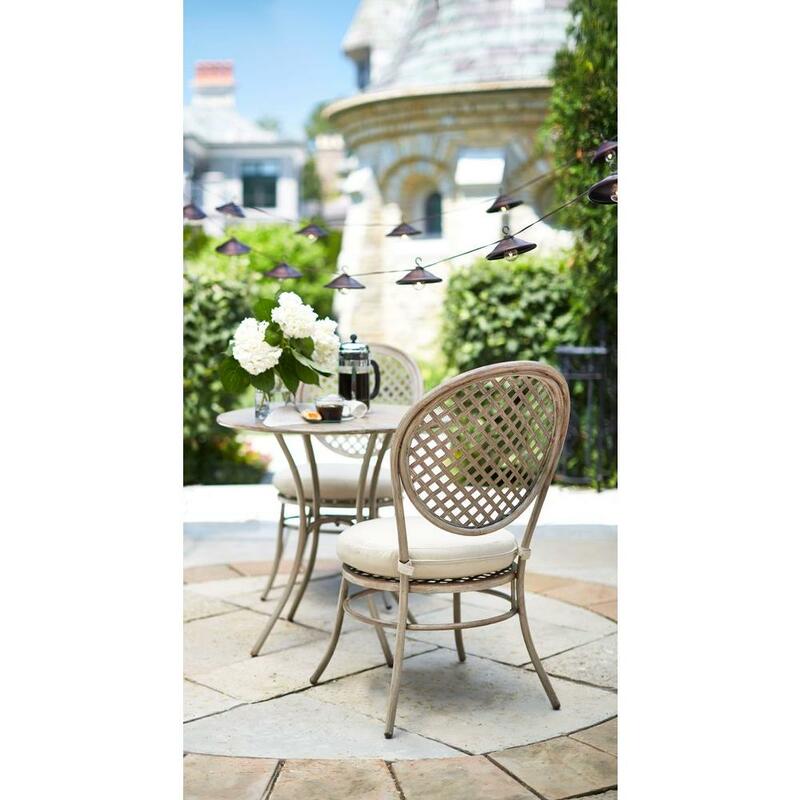 If you are looking for something for one, the hanging rattan chair by Serena & Lily would be perfect for your front deck where you can sit outside and enjoy a glass of wine in the evening. 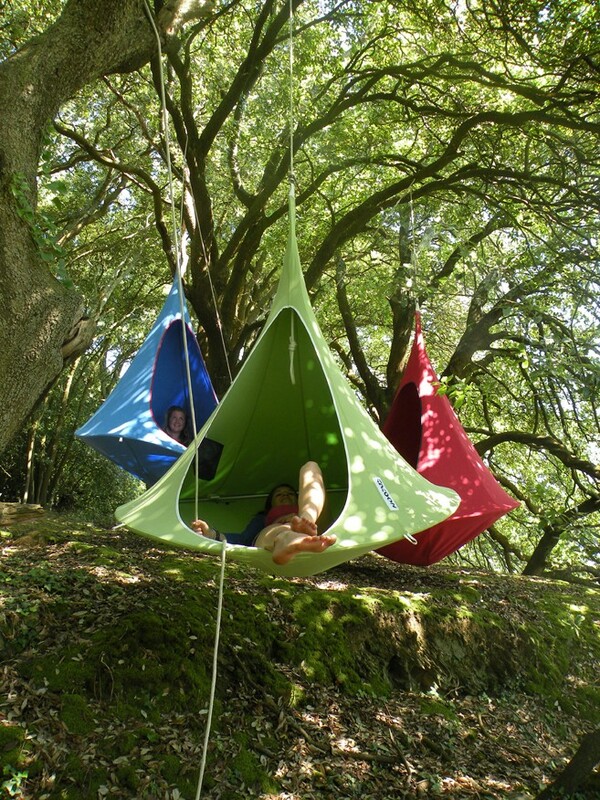 For shady daytime lounging, the cacoon will keep you out of the sun, and certainly comfy as can be! 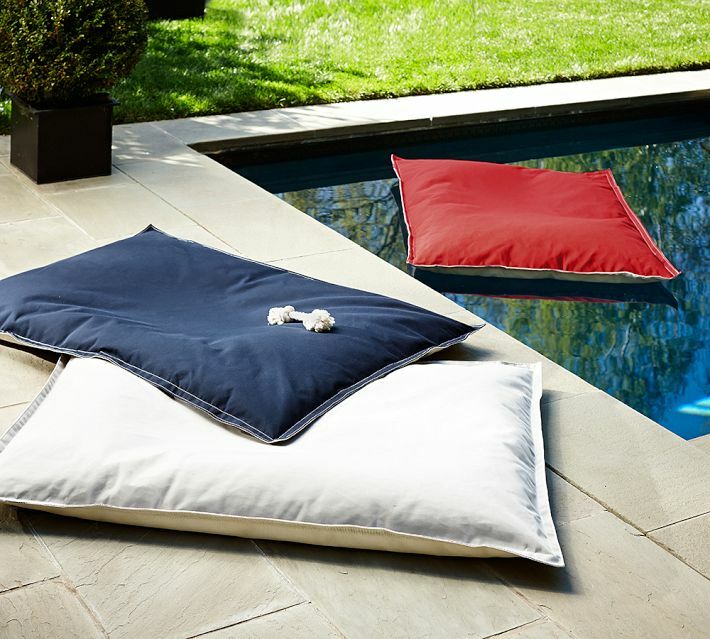 My favorite choice, though, would be these awesome nestrests by Dedon. 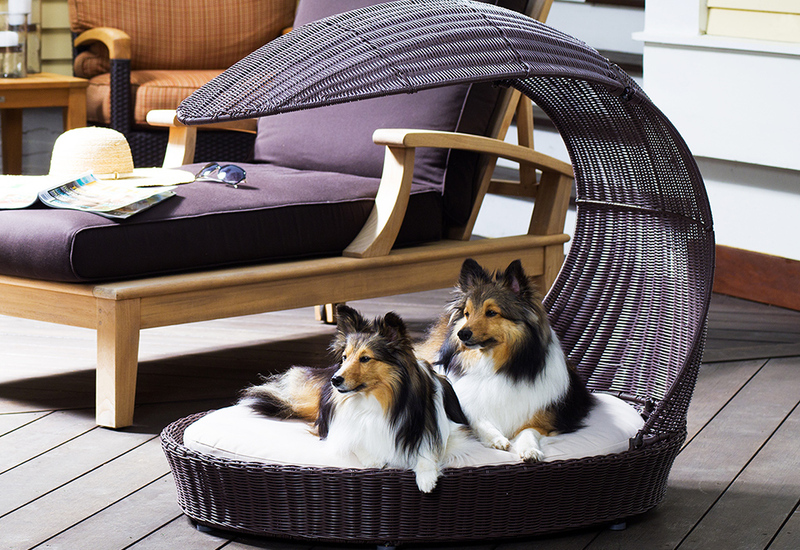 Not only are they SO much fun to have in your backyard, but they seem REALLY comfortable, too! 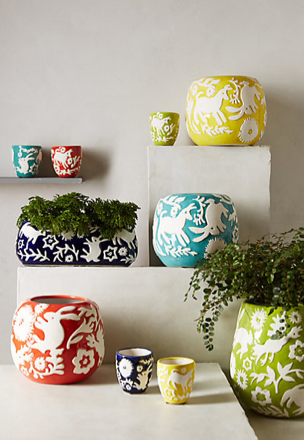 Finally, add some summertime décor to your pool or patio with the Concho garden planter by Anthropologie and Arabesque Lantern by Kouboo. 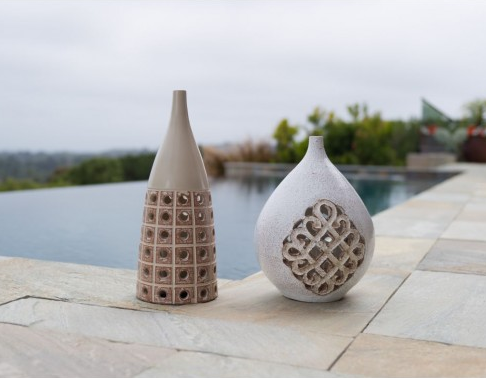 As always, we LOVE that this terra cotta lantern is formed and carved by hand! 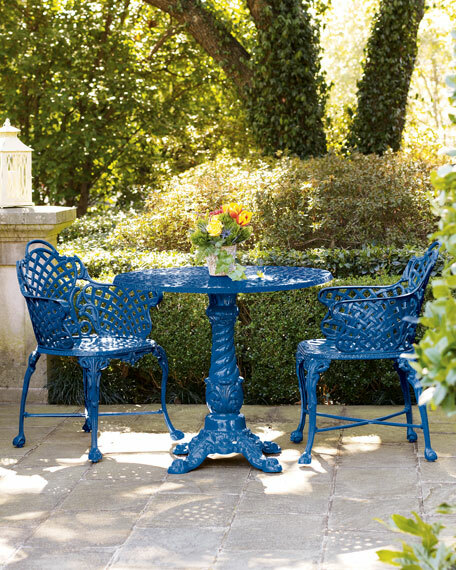 Send us YOUR outdoor inspirations this year! !